Cardinal Nicolò Capocci established a community of Olivetan monks at Montemorcino (to the west of the city) in 1366. In 1404, Pope Boniface IX gave the church of Santa Maria Maddalena and adjacent houses to the Olivetans of Montemorcino, and they established a hospice on the site. They soon sold the properties that housed the hospice, but they retained ownership of the church until 1796. The Olivetans of Montemorcino, together with another Olivetan community from Sant' Antonio Abate, moved to the site known as Montemorcino Nuovo in 1740. They built a church on the site and a huge new monastery. The community was suppressed in 1809. The complex was transferred to the University of Perugia in 1811, because the Palazzo dell’ Università Vecchia had become too small. Giuseppe Ermini, the rector of the University, commissioned the restoration of the main building and re-opened the church (which is dedicated to Santa Maria Annunziata) as the university church. Luigi Vanvitelli designed the new church and convent. It was through his good offices that the young Carlo Murena was appointed as director of the construction project. 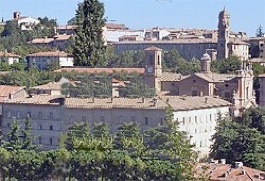 The complex was transferred to the University of Perugia in 1811. The church (which is dedicated to Santa Maria Annunziata) was restored and re-opened as the university church. Its neo-Classical façade dominates what is now Piazza dell’ Università. This altarpiece, which is signed by Sinibaldo Ibi and dated, was commissioned for the Olivetan monastery of San Secondo on the Isola Polvese. The monks took it with them when they moved to Sant’ Antonio Abate in 1624 and to Montemorcino Nuovo in 1740. Agostino Tofanelli moved it to the Musei Capitolini, Rome in 1812, but it was returned to Montemorcino Nuovo in 1815. When Montemorcino Nuovo passed to the University of Perugia in 1822, the altarpiece was sent to the Olivetans’ mother house, Santa Francesca Romana, Rome. ✴St Ambrose absolves the excommunicated Emperor Theodosius after the massacre of the citizens of Thessalonica. ✴the altarpiece of St Ambrose absolving the Emperor Theodosius (illustrated here) was transferred to the gallery (link above). This panel by Ludovico Mazzanti from Montemorcino Nuovo depicts the work of St Bernard Tolomei during the Black Death in 1348. It is now in the Galleria Nazionale. (It is illustrated in the website Cultura Italia).